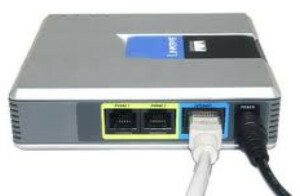 A VOIP ATA (voip box) which connects between your phone and internet router to enable your normal household phones to use VOIP. VOICE Over Internet Protocol (VOIP) is overlooked by many Internet users as cashed up Telcos market bundles of products together (landlines, internet, latest smart phone & tablet). But how can those bundles compare with VOIP call rates? VOIP is a another communications protocol, like HTTP (web sites) or email. It is another opportunity for communication that is available once the Internet is connected and many users use VOIP to replace all or part of their landline telephone service saving a great deal in the process. Most ISPs (Telstra and Optus excluded) offer a number of VOIP plans in addition to Internet services. There are also companies that offer just VOIP services without being an ISP. VOIP should not be confused with a bundled service that might be provided by your phone provider. For people that regularly call other countries or even other states the savings can be substantial. There are also savings if regularly calling interstate as these calls are un-timed and from 8 cents a call. Even better there can be no monthly plan even at this low call rate so callers just pay for the call with no ongoing monthly commitment. Plans are available for higher volume calls with even more savings. My wife frequently calls a mobile phone in Thailand for 1 cent a minute with no flag fall and no monthly fee. She talks for 20 minutes and all we pay is 20 cents all up. We can’t even call next door using any major Telco for that. That is streets ahead of any bundled service any Telco will offer. Other countries such as USA or UK can be 2 cents/minute.